The reason I didn’t blog last week was that my post-work time was for the most part consumed by either watching TV or preparing the Saturday game of Pathfinder. It’s been a while since I last blogged about it, but I want to start writing more regular session reports. Spoilers abound. Most of our party managed to reach level 3 after clearing the Catacombs of Wrath in the previous session, with only the rogue lagging behind because he missed a couple sessions. I am not 100% convinced about the experience point rate. Pathfinder uses three different XP tracks: fast, medium and slow, based on what kind of game you want to play. The slower the track, the more experience points a character needs to level. We’re playing the Rise of the Runelords Anniversary Edition, which is set up using the fast XP track. As we’re 6 PCs, and RotRl is set up for 4 PCs, I had to adjust encounters a lot. In the Catacombs of Wrath, the first real dungeon of the adventure, I pretty much tossed in quite a few more sinspawns than originally planned, nearly draining the minor runewell. All the extra monsters accounted for extra experience points, taking them almost halfway through level 3. I have been toying with the idea of not awarding experience points anymore, and instead leveling the characters at certain story milestones. I do however have the impression that people are really excited to get their experience points at the end of the night. I guess it’s the ol’ draw of MMOs as well. Leveling and loot are very gratifying, and as they’re all fairly new to pen&paper, I don’t want to deprive them of this kind of excitement. Rest in peace, Koruvus. They’ll never know your story. On the other hand, awarding experience points based on challenges also greatly encourages murder hobo behavior. In session 6, the party pretty much methodically explored every room in the catacombs, slaying all that were there, never once stopping to question anything they saw at all. Murder, loot, rinse and repeat. As a story and RP opportunity, it fell flat. I also did not do my best as GM to present the main antagonists, Koruvus and Eryllium, as more than cannon fodder. I can only strive to do better with the finale to Burnt Offerings. This Saturday the group, minus the player of the barbarian, continued where we had stopped last, looting Eryllium’s dead body. The party tried a bit half-heartedly to investigate the well in the cathedral, but gave up quickly. Instead, they decided that they would cleanse the catacombs by taking some of the Water of Lamashtu that they found outside in vials, and then went back to get a town guard to bring them stuff to set the zombie traps in Koruvus’ room on fire. After they set the zombies on fire, they left the catacombs behind, instilled fear in the townguards outside of the Glassworks who had let a sinspawn escape to murder a Sandpoint citizen the night before. The party then split up, to sell their loot and to inform Sandpoint’s mayor of what they had found underneath the Glassworks. Our rogue and the druid make a terrible tag-team of greed, both being Chaotic Neutral, and played the mayor like a fiddle once they stopped the intimidation route the rogue was taking by tossing Eryllium’s dead body on the mayor’s desk. Instead, they decided to sweet-talk her and aided each other with diplomacy rolls to receive further assistance with their next step forward, investigating the goblin stronghold Thistletop. The mayor promised them to purchase masterwork weapons for them. Yup, I brought it onto myself, power creep at level 3. It was just a pretty great diplomacy roll and good RP which I wanted to award. I will just have to continue making the challenges tougher. The other party members sold off all their loot, had the wand and scrolls identified, and that was pretty much it for the day. The next morning there was some shopping of masterwork weapons, and then the party decided to head towards Thistletop. Sort of. They didn’t really seem sure what to do, so I gave them Tsuto’s journal page again. Instead of heading out directly for Nettlewood, they decided they would use the smuggler tunnel underneath the Glassworks. Soon they were trudging along the coastline, somewhat aimlessly. The ranger found an obviously goblin-trodden path that steeply led up back to the main road. 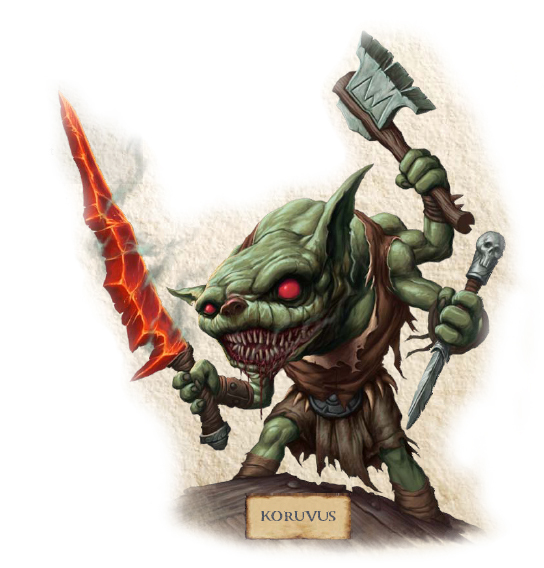 A small pack of goblins assaulted the longshanks on the main road and were quickly taken care of. Instead of pushing onward, they decided to go back to Sandpoint to get their horses and buy a map of the hinterlands. Little did they know that Nettlewood and the approach to Thistletop don’t really allow for horse-riding. Speaking of horses, when they finally reached Nettlewood, they found a distraught horse breeder with a cart who was traveling towards Sandpoint and then Magnimar to sell his prize horse Shadowmist. Only that he was assaulted by a horde of goblins who didn’t bother with killing him when he hid under his cart and instead dragged his horse off. The gnome ranger gave up her pony so that the breeder could travel to Sandpoint and then followed the tracks leading into the dark Nettlewood full of briars. Eventually the forest became impenetrable until they discovered a briar gate leading into a goblin-size tunnel system through the briars, very close to the coast. After the gnome ranger scouted and did not locate any enemies, the rest of the party joined. The gnome ranger, halfling sorcerer and the half-elf druid were fine walking through the briar tunnels, but the rogue and the paladin had to squeeze their way through. With this cliffhanger, we stopped at 1 am. I am quite fond of this cliffhanger, because it means I can prep the encounter and hopefully make it the most dangerous one they have faced yet for next time. Based on the speed with which we were progressing, I would say that the resolution of this last chapter of Burnt Offerings will likely take at least 3-4 sessions for us, as the pace is relatively slow. A lot of this session was pretty much filler material, character maintenance, really. Selling loot, identifying, buying stuff. As one of the players complained, it felt a bit like Shopping Queen, a German reality TV show. Because that all took so long, the adventuring part was a bit thin. I think sessions like that can’t be avoided. I would have liked to see more RP of the plotting and planning part, but I think they’ll have to learn that yet. At the end of the night, they did not get the bombastic amount of experience they had gotten the previous session and sighed a bit that of course there hadn’t been enough combat, which made me try to explain that it’s not only combat but also creative RP that earns them experience. I guess that’s the downside of a system like Pathfinder, rewarding combat too much. On the technical side of things, I experimented a bit more with how to best experience the sound effects from Syrinscape. Our rogue brought his bluetooth speaker along. I ran Syrinscape on my Nexus 7 tablet and put the speaker in the middle of the table. The speaker itself has excellent quality but the tablet has fairly low volume settings, which meant the ambient sound effects just didn’t work well. Also, around 11 pm the speaker lost its charge, and when I tried to charge it via USB, it didn’t pair with the tablet anymore. Ultimately, I decided that next time I will run Syrinscape on the laptop again and will use my TV’s soundbar for all sound effects. Other than that, I still think Syrinscape is the bomb. I used roll20 again for the map, and learned a lot this time around in prep. I am using my maps off Deviant Art because the artist hero339 makes gorgeous maps over there. I hope by the time we get to Skinsaw Massacre, he will have created maps for it as well. Speaking of Deviant Art, it’s really a treasure trove for Pathfinder related art. hero339’s maps are glorious, but they’re also enormous, and roll20’s upload limit per file is 5 MB. The Thistletop map I am using is 28 MB however. I went ahead and cut the map into six pieces using Photoshop and then saved it as web jpgs, reducing their size to around 5 MB each. I was then able to upload all six parts, enlarge the canvas size for the map layer and put all six pieces together like a puzzle. I made a couple mistakes when cutting the map, and so some connecting pieces have an irritating white line, but it’s no dealbreaker. It still looked pretty awesome. 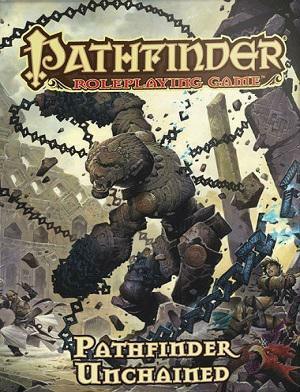 Paizo recently released Pathfinder Unchained, a sourcebook that offers optional rules and new systems for any GM to pick and choose from. 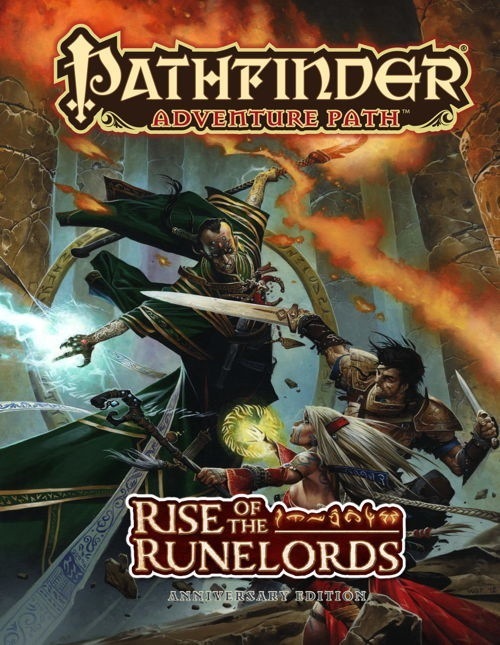 Amongst the most interesting parts of this book is a class overhaul for four classes that Paizo deems a bit problematic: barbarian, monk, rogue and summoner. As I have two of these classes in my game, and play a rogue in another, I am very interested in these changes. As far as I can tell, the barbarian’s overhaul is to make the rage mechanic more transparent. I’ll be honest, one of the reasons I run Hero Labs in my game is that I can toggle rage on and off, and see the changes in stats immediately, without having to calculate anything. Anything to make this easier on player and GM is a bonus in my book. The rogue part is even more interesting. Our rogue complained that compared to pretty much anyone else he kinda feels useless in combat. Playing a rogue, I have exactly the same issues he has. I am squishy, as a Bilbo Baggins-style rogue I have a very slow movement rate. By the time I arrive at a monster in order to flank, it’s pretty much dead already. All the rogue seems to have going for the class is the skill monkey approach. From what I have read, the Unchained rogue is a nice improvement. I will be offering my rogue the chance to play one and if it’s good, I might try to convince my other GM to switch to Unchained for my rogue as well. I am super-excited for the Ultimate Intrigue playtest coming up in mid-June. It’s going to be a new sourcebook to be launched in spring 2016, and it is described as follows: the new Pathfinder hardcover that delves into the shadows, where charm, grace, innuendo, and insult may be more powerful than a sharp sword or spell. Color me intrigued already! Anything that enhances roleplay outside of combat is a big plus for me. Paizo playtests are pretty great, because they let you download the current rules, test them in your own games and then provide feedback on to how it works. I didn’t participate in the last playtest for Occult Adventures because I think core rules and Advanced Player’s Guide provide plenty of classes already, but Ultimate Intrigue only seems to have one additional class, the Vigilante. Ah, by the Maker, the shopping trip “game”. I’ve been doing this for well over 15 years now and I have yet to figure out a good way to deal with it outside of running games where equipment plays almost no actual role. It’s the worst in games that are equipment heavy or favor compensation with money (e.g. d20 systems, Shadowrun, or anything sci-fi themed). I can tell you that I have tried numerous times to get players to do their shopping on their own time so it doesn’t eat up the time we have together. The problem is that it depends on everyone doing the homework or else you have one or two players that are just, effectively, zoned out for the night (or worse, one or two that did the homework and are penalized wile the other 3-4 monopolize the host’s time and attention). That would have worked out well. As a druid favoring ranged weapons I wasn’t sure what to get cause a masterwork slingshot just sounds silly…. I spent a good few minutes looking up weapons and there’s no reason that couldn’t have been done outside sessions in this case. On the other hand I think I did it during other players’ smoke breaks or while the part was split and focus was on the other half.